Electric bikes are great, and with all the noise currently being made about e-bikes, you might be considering to buy one. But do you really have to buy a brand new electric bike when you can convert your existing bike by just spending quarter the amount you have to pay for a brand new e-bike? 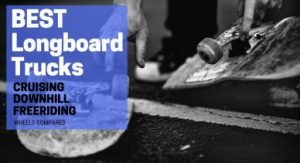 Whether you ride a hybrid bike, mountain bike, or a road bike, there is a number of ways to electrify your bike and remove those roadblocks and challenges that many people face with traditional bikes. So all you gotta do is replace a powered wheel either with the front or rear wheel of your existing bike or if not the wheel then attach a drive unit to the bottom bracket of your bike and you can start zooming up those hills. Pretty easy right! That’s all you have to do to convert your existing bike into an electric bike. With that said let’s find the best electric bike conversion kit which will best suit you and your bike. Now, let’s take a look at the options you’ve got! Let’s take a look at the feature overview of the Top 3 Best Electric Bike Conversion Kits. After that, we’ll go through all the different types of e-bike conversion kits. So, without any due let’s get started. The front hub motor is the simplest and the easiest way to convert your normal bike into an electric one. In this type of bike conversion, all you have to do is replace the front wheel with the motorized wheel, and the rest of the bike remains exactly the same as before. 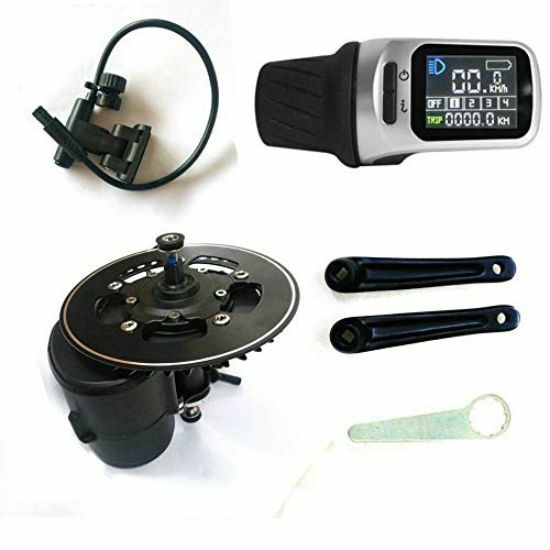 Most of the time a front wheel conversion kit features a front wheel with a hub motor, a battery, speed controller, electric brake handles to cut off any power while braking, an LCD display panel, and throttle which is either a twist throttle or a thumb throttle. Also with front hub motors you may or may not get a pedal assist sensor, so you do have to look out for this feature. BATTERY RECOMMENDATION: The system requires an Electrokinetic cell battery (Li, lead-acid, NiMH battery, etc.) with nominal voltage 48v and nominal capacity, not less than 17Ah. AW front wheel conversion kit is the best electric bike conversion kit that offers more than its pay grade. 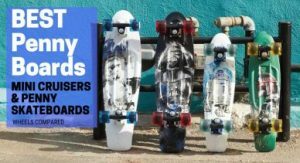 It features a really powerful 1000W brushless motor which can take you from 0 to 28 mph in just under 7 seconds. INSANE Right! An LCD display panel that displays time, battery level, speed, mileage, and gears. Cadence sensor or a Pedal Assistance System (PAS) that kicks in as soon as you start pedaling. Apart from that, AW e-bike conversion kit does come with everything that you need to electrify your bike, but you do have to buy a battery before going for a spin on your new DIY Electric bike. 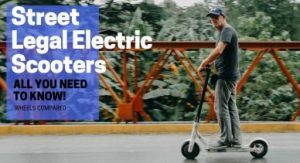 Other than that it’s a good bargain for money when you can convert your existing bike into an electric bike for just a fraction of money when some brands are charging their customers thousands of dollars for the same thing. BATTERY RECOMMENDATION: The system requires an Electrokinetic cell battery (Li, lead-acid, NiMH battery, etc.) with nominal voltage 48V and nominal capacity not less than 11.6Ah. The other e-bike conversion kit is from Voilamart. It is one of the best front wheel conversion kits that you can get for the money. Its only for around $150 which makes it the most affordable option when it comes to replacing the front wheel. 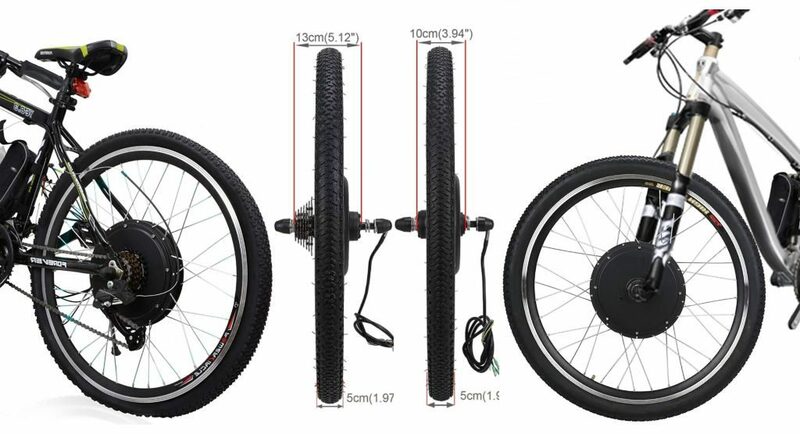 So you can choose between any of the two motors, and along with this, you’ll get a 26-inch front wheel with Alloy double wall rim and Nylon tire. The voilamart conversion kit also comes in with Pedal Assistance System (PAS) and Brake Levers to cut off any power while braking. Other than that if you opt for the 48V 1000W Motor, you’ll be getting two power modes which allow you to switch between full 1000W power and 750W power when using the throttle. On the other hand, when you are paddling, you’ll be getting full 1000W power in PAS mode. Clean Republic is one of the biggest names when it comes to electric bike conversion kits. They make almost all types of motor hubs so you can convert your regular bike in any way you like. What is great about this conversion kit is that they are way too simple to install and use. So, you’ll be able to transform your bike or tricycle into an electric bike in less than 30 minutes and hit the road. 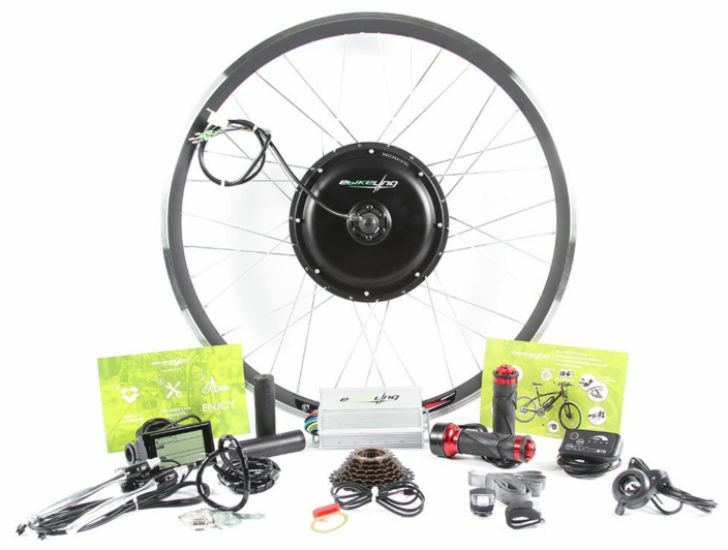 There are two options when it comes to e-bike conversion kits from Clean Republic. 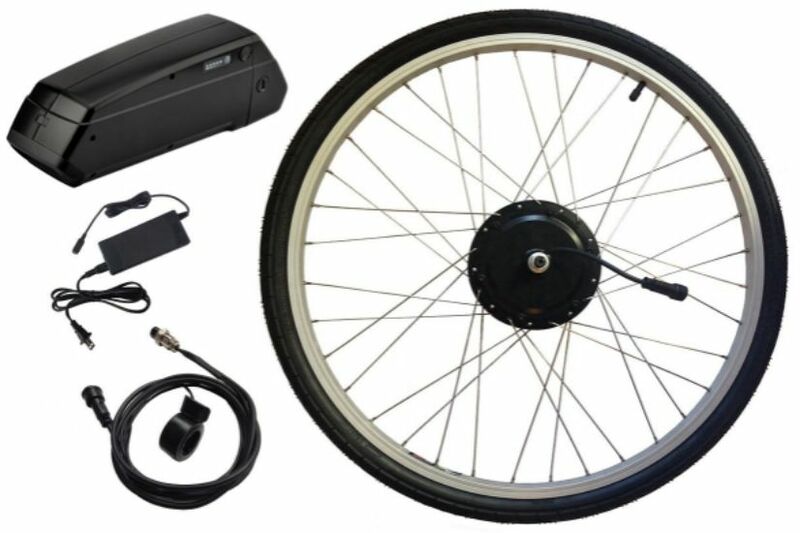 The third electric bike conversion kit comes in with a 24V 250 W front motor hub and also features a battery. When it comes to the battery you’ve got two choices; choose either a 12 mile or 20-mile lithium-ion battery. Though the motor is not that much powerful as compared to the previously reviewed models but it can easily provide you a top speed of 15-18 mph on throttle only and with pedal assist you can easily increase that limit. If you need more power under you, Clean Republic also offers a 36V 350 Watt motor which can reach a top speed of 20-22 mph on throttle only and if you need to go even faster you can use the PAS (Pedal Assist System). Other than that with the 350W front motor hub, you also have two options when it comes to the battery. You can either go with 20 mile or 40-mile lithium-ion battery. The last e-bike conversion kit under the front wheel section is from Megabrand which is a 48V 1000W motor integrated with a 26-inch wheel. It’s a quiet and reliable brushless motor with a top speed of 28-30 mph without spinning the pedals at all. So you’ve got plenty of power to take off from traffic lights with buses and cars behind you or just climbing those steep hills with throttle only mode. Apart from that, you’ll get everything that you need to electrify your bike like speed controller that displays battery level, push throttle and power break lever to cut off power while stopping. Note: This bike doesn’t feature the PAS (Pedal Assist System) and the battery is also not included. A rear hub motor is considered a bit better than the front wheel conversion kit because it provides you with more control and traction when you push that throttle. Also, almost all the manufacturers that are building electric bikes feature a rear hub motor unless it’s a mountain bike. 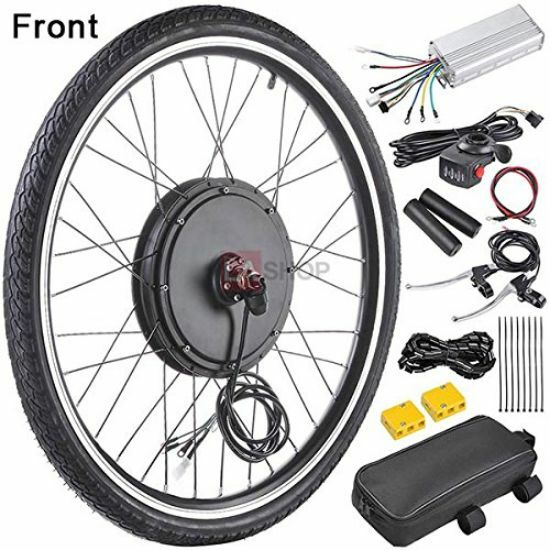 Rear wheel electric conversion kit features a rear wheel with the hub motor which goes unnoticed since it looks much like an oversized traditional bike hub. It also includes a battery, speed controller, electric brakes, an LCD display panel, throttle, and almost all the rear wheel conversion kits come in with a pedal assist. If you are considering getting a rear hub motor, then AW 48V 1000W motor is the best option for you. The value that AW conversion kit offers on the table is through the roof. You can get it for around $250 and can fit it on any bicycle of your choice. 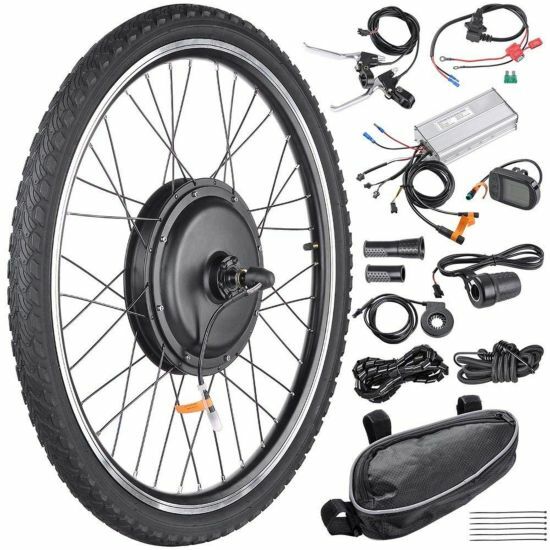 Just like the AW front wheel electric bike kit, the bike features a 26″x1.75″ aluminum wheel with the tire and an electric controller. The controller is a dual mode controller that extends the lifespan of the motor by switching between Hall-effect and Non-Hall effect. Apart from that the kit also features an LCD display that indicates battery level, speed, time and mileage. The motor is also equipped with latest AW PAS (Pedal assist System) technology which makes riding short or long distances easy and full of joy for you. BATTERY RECOMMENDATION: For the battery, recommendations check the manufacturer’s instructions on Amazon.com because it varies with the motor you are using. Apart from all the motor options Voilamart conversion kits are one of the best value electric bike conversion kits in which you can enjoy all the features that you only get in high-end electric bikes, but the difference here is that it will only cost you a couple of dollars. 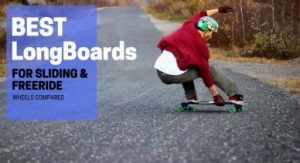 Voilamart uses powerful brushless gearless hub motor that ensures top speed consistently and gives riders an adjustable 5 level intelligent pedal assist mode and a twist throttle to take off from your stationary position. What really stands out about this electric bike conversion kit is the quality and components Voilamart are offering at such a reasonable price. The only thing that’s not included in the package is the battery, so you do have to buy one. Apart from that, it’s by far one of the best e-bike conversion kits on the market. Also, it’s quite easy to install all you need to look for is that you are using the right battery. For 500W, the motor requires an Electrokinetic cell battery (Li, lead-acid, NiMH battery, etc.) with nominal voltage 36V and nominal capacity not less than 10Ah. For 1000W, the motor requires an Electrokinetic cell battery (Li, lead-acid, NiMH battery, etc.) with nominal voltage 48V and nominal capacity not less than 11.6Ah. For 1500W, the motor requires an Electrokinetic cell battery (Li, lead-acid, NiMH battery, etc.) with nominal voltage 48V and nominal capacity not less than 14.5Ah. BATTERY RECOMMENDATION: The system requires an Electrokinetic cell battery (Li, lead-acid, NiMH battery, etc.) with nominal voltage 48V and nominal capacity not less than 14.5Ah. The last rear wheel conversion kit on our list is from EBikeling, which is a brand that makes products specifically for electric bikes. So what can you expect? They make one of the best electric bike conversion kits for the price and also are well known for the exceptional performance and build quality of their motors. Just like the Voilamart, the EBikeling also features three different types of power options, or I should rather say rear hub motors. 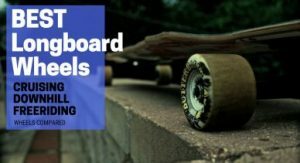 What’s really good about EBikeling is that they really put everything out there for you to choose from a front or rear hub motor, or choose between a thumb throttle or a twist throttle and if that’s not enough you can also choose between your display panels. You can choose either the LCD Display or the LED Display. Cool Right! The LCD display shows you a handful amount of features like the battery percentage, your speed, mileage, wattage, PAS levels that you’re in and if you encounter any error it will also show you possible error codes for easier troubleshooting. Apart from that, the kit comes in with all the necessary components that you need to electrify your bike like brake levers to cut off power from the motor safely, EBikeling PAS sensors, a torque arm, front & rear lights to make you visible on the road. The only thing that’s not included in the kit is a tire and a battery, but you really can’t complain when the value for money is just INSANE with all the features and components that EBikeling brings on the table. 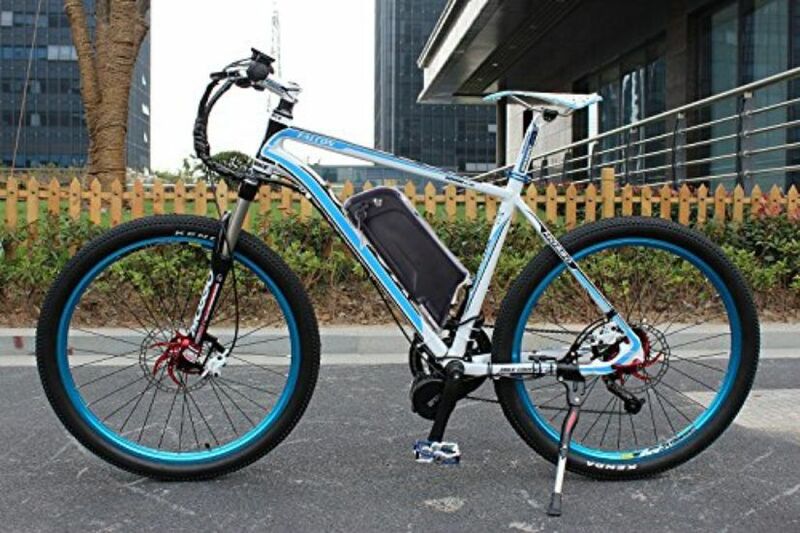 In mid-drive electric bikes, the motor is integrated with bottom bracket and cranks which places the motor at the center of the bike and in turn, evenly distributes the weight of the motor. That’s the reason why mid-drive motors are considered the best option for any type of off-roading or mountain biking, where you need your bike to be perfectly balanced. Though mid-drive units are a bit more expensive than hub motors but it has its reasons! Also, there’s a reason why most of the people prefer mid-drive units. In a mid-drive or central system, the motor is directly connected to the crank drive. So as soon as you start pedaling the motor drives the crank arms which can now take better advantage of the range of gears. Also, a torque sensor can now easily measure the amount of input from the rider. So what this sensor does is that it automatically varies the amount of assistance from the motor with the intensity of the rider’s pedaling that creates a smoother and a more fluid riding experience for the rider by precisely varying the amount of assistance from the motor and simply by matching the amount of intensity of the rider’s pedaling. 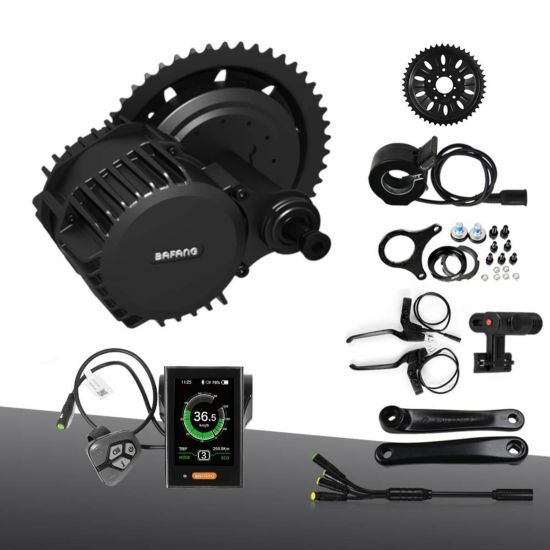 Apart from that many of the big brands like Yamaha, Shimano and Bosch in the e-Bike industry offer top of the line mid-drive units but the problem with those mid drive units is that they can’t be fitted in any bicycle frame, so you need a frame which is specifically built for these drive units to give you the best performance. But don’t worry there are some brands for you too! So I’ll suggest you look for brands like Bafang or 8fun which make some of the best quality mid-drive units that can be integrated on any bicycle frame. The first mid-drive electric bike conversion kit is from Bafang and is quite an expensive one. But is by far one of the best mid-drive units that you can get for the price. You can get this full kit for around $1000 but don’t worry because for those on a tight budget I’ve also got some affordable options. But remember this is the best option if you can afford it, with a 750 W motor and a 48V 12AH water bottle mount Lithium Ion battery you can hit the road as soon as you get it and it can take pretty much anything that you throw at it, either it be steep hills or mountains; this system is ideal. Like any other powered bike, this mid-drive system gives you two working modes; you can either switch between the pedal assist or choose the throttle only mode which will give you a burst of speed (ideal for pulling away from traffic lights). By default, the bike comes in with push throttle, but you can request the manufacturer to feature a twist throttle when placing your order. 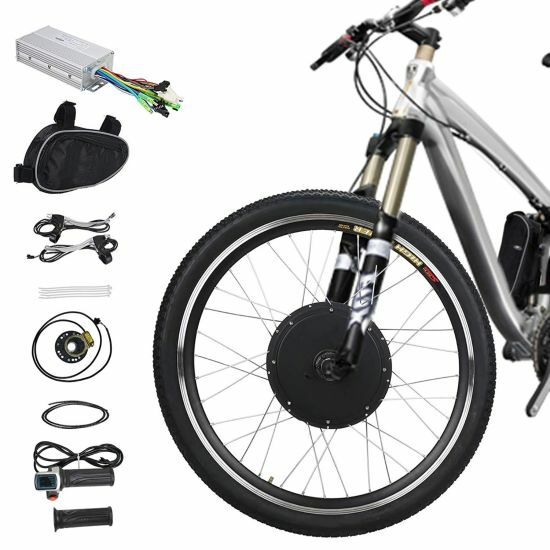 Overall its quite a complete electric bike conversion kit as it’s got everything that you need and will perform as good as it looks on the paper. This is the most powerful mid-drive kit on our list and being from BAFANG; you can rely on them with your eyes closed. BAFANG have been in the biking industry for a while now and have made a name for themselves over the years with satisfied customers. 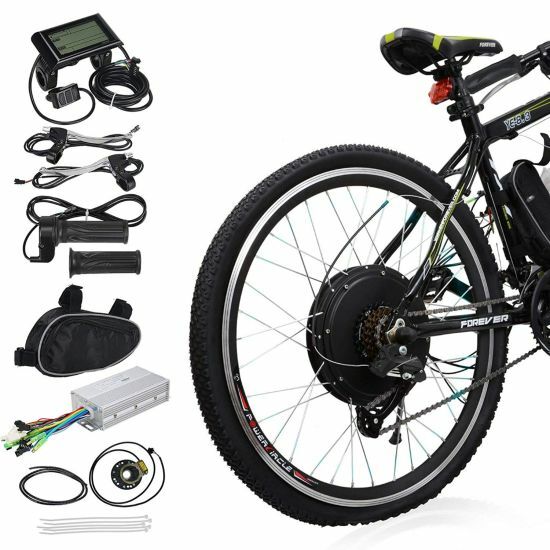 This mid-drive electric bike kit features a central 48V 1000W motor that can be fitted on any bike that you have. You can fit it on any normal bike with 68mm bottom bracket to fat bikes with 100mm to 120mm bottom brackets. Other than that the kit also comes in with three different chairing sizes 42T, 44T, and 46T. Apart from that if you wanna go with power, then this is the best mid-drive electric bike conversion kit that you can find on the market. BATTERY RECOMMENDATION: The system requires an Electrokinetic cell battery (Li, lead-acid, NiMH battery, etc.) with nominal voltage 36V and nominal capacity not less than 10Ah. As we are moving down the list we are moving towards more and more affordable options; these mid-drive units offer you the same high build quality and performance, the only difference is the power. This particular mid-drive kit comes in with 9 different pedal assist modes; one is a non-assist mode apart from that you can kick in that full power by pressing the throttle at any time and in any mode that you’re in. 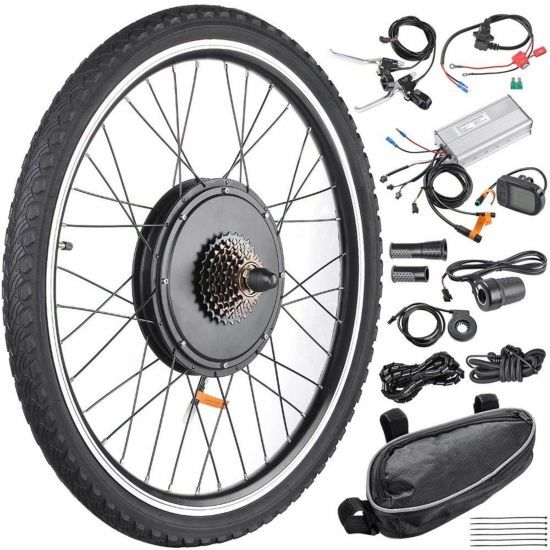 You can get this mid-drive e-bike conversion kit for around $500, which if you’ll ask me is a hell of a bargain when it comes to mid-drive units that are way too much expensive. So if you are into mid-drive units this the best that you can find for $500. Tongsheng is a Chinese company but doesn’t get me wrong it’s not like most of the Chinese products which are unreliable and cheaply built. TSDZ2 mid-drive conversion kit is surprisingly one of the best mid-drive electric bike conversion kits that you can get for under $400. 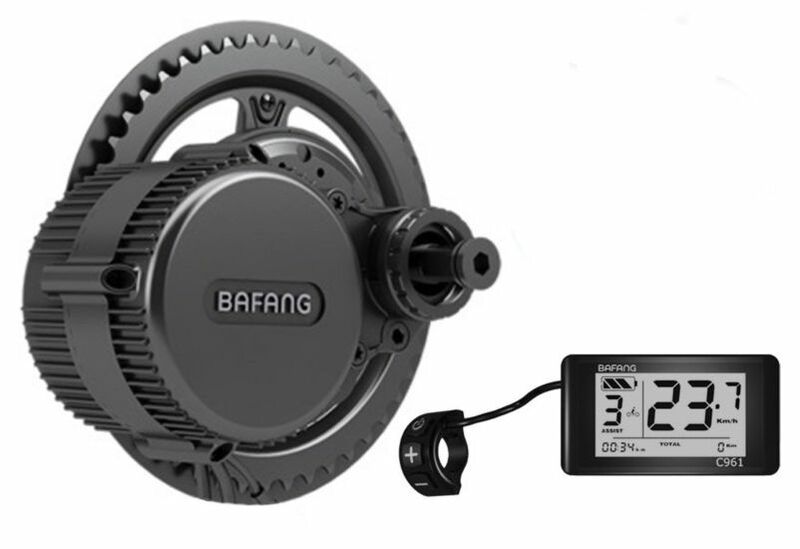 Though it doesn’t provide many features like the other Bafang mid-drive units that we have reviewed earlier do, but it’s cheap and gives you an exceptionally good central motor that performs as good as a Bafang motor, but you have to compromise on some features. Like there isn’t any throttle mode in the Tongsheng TSDZ2, which is the biggest drawback but if you only use the pedal assist. This bike has some serious stats as you can reach a max speed of 24 miles and on average you can easily maintain a speed of 14-20mph which is great. Tongsheng motor comes in with built-in torque and cadence sensor. This is what makes it good for only pedal assist and results in smoother acceleration. So, at the end of the day, you get what you pay for. Also, this mid-drive electric bike conversion kit doesn’t feature any brake lever or battery. At the end of the day, it all comes down to you which electric bike conversion kit you choose, either you prefer a hub motor or a mid-drive unit it’s your call! But before going for a particular e-bike conversion kit just ask these two questions. Where and how I’ll be riding mostly? First of all answer your first question. If you’ll mostly be riding on flat surfaces and paved roads where you don’t need that much power of a mid-drive unit to climb steep hills and just need a bike for casual riding around town or for the daily commute to and from work than a hub motor is perfect. On the flip side if you live in an area where you have to do a lot of climbing on steep hills or like to take your bike off-road on mountains and all, then a mid-drive unit is perfect for you. Also if you’ve got a mountain bike, then it’s out of the question which type of conversion kit you need. Just go for the mid-drive unit. In most of the cases, a mid-drive unit will work fine in any kind of situation, but the thing is that they are expensive. So when going for an e-bike conversion kit, have a specific budget in your mind and make sure that you stick to that budget. My final advice for you is not to be put off by all the different e-bike conversion kit technologies out there and think of it as something that’s not a cookie cutter product; it’s an opportunity for you to build something with your own hands and find that perfection in it. Also do let me know which electric bike conversion kit you choose, or if you need any kind of suggestion from me or want to give your opinion hit me up in the comments section.